As you know by now I have a love of the odd statement necklace or two (small exaggeration I know more like thirty or so....) not to mention my love of bracelets & wearing multiple ones at the same time. But as any true girl worthy of the nickname 'Magpie' my love of all things sparkly also extends to rings too. I seem to go through stages of wearing cocktail rings, mainly because when working on the computer all day due to the weight & size of some of my rings they can have a tendency to keep twirling round which can be a tad annoying to say the least. But like a statement necklace a cocktail ring worthy of the name can add a real statement to the plainest of outfits & bring that bit of character & individuality to your look. Of course with Christmas now fast approaching it couldn't be a better time to look at all things sparkly because surely we're doing the hubbies a favour by pointing them (by pointing I mean find said Christmas present emailing them the link & waiting for them to simply press the 'buy me' button ;-) ) in the direction of what we'd like awaiting us under the Christmas tree on Christmas morning. And whilst I've found an amazing shop in Palma that makes some simply stunning pieces of jewellery, seeing as we stuck in good old Blighty (well unless you're very lucky of course & fitting in a mini-break before the festivities hit us) then I've taken a look to see what statement pieces are available online. First up I've discovered this amazing brand which I hadn't heard of before who seems to be stocked in several main online retailers. 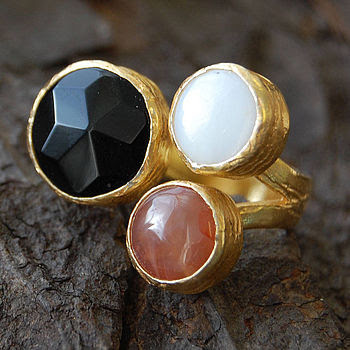 For me their designs simply sum up everything I want in a statement ring (other than the diamond variety of course!!!). Now I have a HUGE weakness for stacking rings or rings that look like they've been stacked, which stems from a time when shopping in Covent Garden some twenty plus years ago where I spotted some gorgeous coloured ones which I was tempted to buy but didn't & have regretted it ever since. 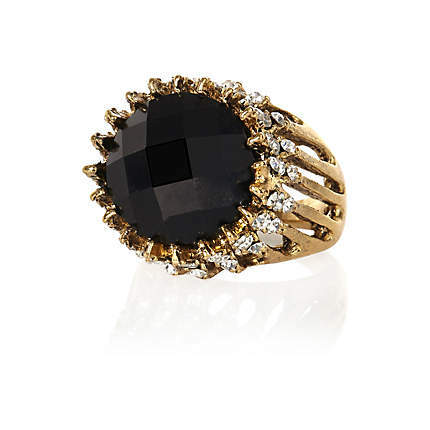 If you don't fancy such a statement piece then how about this two stone horizontal ring? 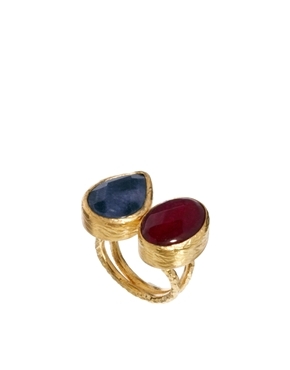 Again the coloured stones against the gold look so beautiful & would make such a lovely gift. Imagine this worn with a classic white shirt, some smart skinnies & court shoes....totally elegant & chic & hell if you happened to find some amazing stacking gold bangles & necklace to team with it, well need I say any more?!! If you prefer something of a more simple design then this square ring should tick the box & such a stunning colour for winter that would go with so many outfits - black, navy, grey, khaki & denim. Moving back to more of a stacking design then this cocktail ring from Embers also ticks all the boxes & having lighter stones in the design would be perfect for all seasons. 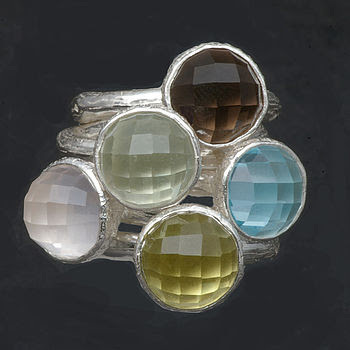 However, for a true stacking design then these ones from Anthony Blakeney tick all my boxes, I love the fact that you can choose which coloured stones you want. Not to mention that come special occasions you could add to your collection so you could alternate & make the ring look different on different days by the amount of rings, colours you wear & the order in which you stack them. Not to mention simply keep on stacking to your heart's content........I mean you don't need to be able to bend your knuckle surely?!!! For the cocktail ring virgins amongst us if you fancy starting with something a little more simple then how about this natural stone ring from Massimo Dutti? Simply elegant, a colour that can be worn with anything & look equally stunning no matter what the season. 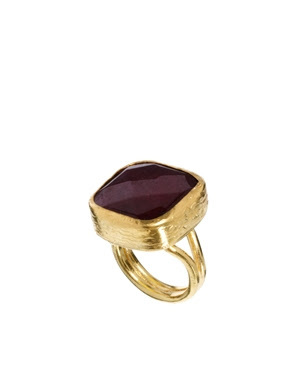 Another brand I've recently discovered & loving is Ashiana, they make some amazing pieces including this stunning square cocktail ring, I totally love the shade of this stone. Which looks equally stunning in brown too & quite frankly you can't beat the look of gold against the colour of the stone, so exquisite & expensive looking. 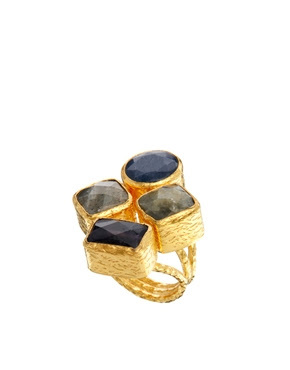 Of course having mentioned my love of multi stone designed rings it won't come as any surprise to hear that I love this Manhattan designed one from Ashiana too. Just the perfect statement piece & a little different to the Ottoman Hands designs in that the stones are all the same colour. Finally most of us seem to have a fair bit of black in our wardrobes, especially when it comes to evening wear so if you're looking for a bit of bling to team with an all black party outfit then how about this statement one from River Island, which even has some sparkle to it too! So there you have my round up of the cocktail rings that have caught my eye. What do you think? Are you a lover of all things blingy & sparkly like me or do you prefer to just wear your best jewellery on your hands? Perhaps you're hoping hubby will pick up the hints you've been dropping & there will be a small jewellery shaped box awaiting you under the tree come the 25th of December? I mean who doesn't love a small jewellery shaped box awaiting them?!!! I'll be back in a few days will a full report on how I celebrated by big birthday & what I've been wearing but in the meantime have a great few days & don't forget to let me know if you're a lover of cocktail rings. Not to mention if you're like me & haunted by a piece of jewellery your saw ages ago & regretted not buying & have forever since been looking for something similar in design....I'd love to hear I'm not the only one!!! A new store opened here called charming charlies, I admit I may have gone there a few times but I'm like a fly to a light bulb. So sparkly. Lovely rings - thought I'd finished shopping for accessories - just bought two cuffs for two different outfits but now will HAVE to get in the car and go hunting for rings.